On Friday 5th April which marks Palestinian Children’s Day, the organization, Palestinian Prisoners’ Association (PPA) issued a statement which said that at least 6000 Palestinian children have been jailed by the Jewish entity since 2015, and that 98% of children who had been detained had been subjected to psychological and/or physical abuse while in custody. Such abuse and torture include beatings, being deprived of food and water for hours, sleep deprivation, humiliation, threats of sexual assault and threats against the child’s family. Often children are denied the right to have a parent or guardian present during interrogation, or even have visits from family during their imprisonment. Many are brutally arrested during night raids on their homes to cause maximum terror. The UN Office for the Coordination of Humanitarian Affairs documented 336-night raids conducted by Jewish forces in January 2018 alone. In addition, the PPA stated that dozens of minors were detained by the Jewish authorities after first being intentionally shot and wounded, while dozens of others faced repeated arrest within a month, especially during times of heightened tensions such as the Al-Aqsa Bab al-Rahma protests in March this year. According to the Ramallah-based Palestinian Authority’s Committee for Prisoner’s Affairs, the number of Palestinian children currently imprisoned by the Jewish entity is 250, while the Defense for Children International-Palestine has reported that between 500 and 700 Palestinian children are prosecuted in the Jewish authority military courts every year. Arrest and imprisonment are often for minor acts, such as throwing stones at their occupier and usurper of their lands, which the cowardly Jewish authorities label a ‘Security Offence’ and which can now carry a 20-year prison sentence. Earlier this month, footage emerged of Jewish soldiers terrorizing and detaining a nine-year old Palestinian boy, Zein Idris, at his school in Hebron and attempting to arrest his seven-year old brother, for allegedly throwing stones at a settler. 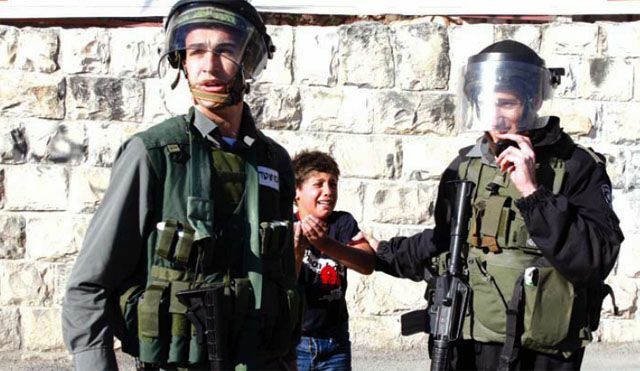 Human rights organisations and doctors have stated that the arrest, imprisonment and brutal treatment of Palestinian children while in custody by the criminal Jewish entity have left them suffering from many psychological and behavioural problems, including nightmares, insomnia and decline in school achievement. Others are left too terrified to even go to school or play with their friends in the neighbourhood. All this is, of course, alongside the continuing violence and slaughter that Palestinian children are subjected to at the hands of their occupiers. According to the Palestinian Minister of Information, at least 83 Palestinian children have been murdered by the Jewish entity since 2017. Can there be any doubt that ONLY the establishment of the true and sincere Islamic leadership, the Khilafah (Caliphate) based upon the method of the Prophethood, which genuinely stands for the interests of Islam and the Believers, can end this nightmare that the children of Palestine and their families are living on a daily basis? It is this state alone which will mobilise its formidable army to liberate every inch of this blessed land from this brutal occupation and return security and honour to the Believers under the protective shade of the Rule of Islam as we saw in the history of the Khilafah. Surely, as a Muslim Ummah, we must reject all false-solutions for this calamity which befell us, for they only prolong the suffering of our brothers and sisters, and instead focus all our attention and energies into re-establishing this glorious state.